System Requirements: Compatible with Zune 30, Zune 4/8/16, Zune 80/120, and technically the Zune HD. Specifications: Kicker has them all. Works with all Zune models, including the Zune HD (the remote doesn't work with it however). Darth Vader-inspired design may not be for everyone. Summary: I've had a Kicker ZK-500 for quite a while now, but never quite got around to reviewing it - it's a character flaw of mine that I'll sometimes start working on a review but not finish it - but seeing as Microsoft is selling the Kicker ZK-500 from their online store right now for a mere $114.99 USD, I knew that I had to share my thoughts quickly before the sale ends. This is one great-sounding speaker dock! 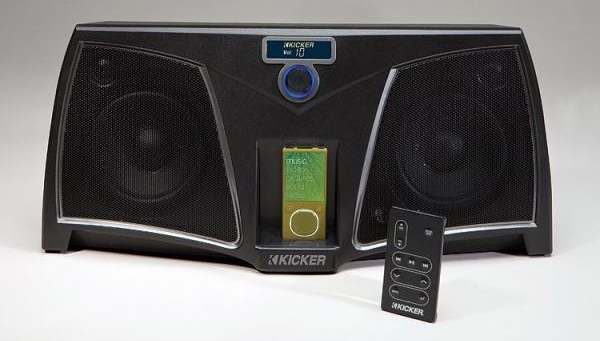 The short version: the Kicker ZK500 is the single best sounding speaker dock I've ever heard, and that goes for any MP3 player. It's compatible with all versions of the Zune, and given that the Zune HD is using the same connector, it will be compatible with that too - though you may need to tweak one of the plastic dock shells to get it to stay in place properly (UPDATE: the Zune HD sits in the cradle just fine, but the remote doesn't work with it at all). Hopefully Kicker will sell a plastic dock piece for it. At the original price of $350 USD, the ZK500 was a great-sounding high-end audio solution for people with deep pockets. At its current price of $114.99, it's a steal and I urge you to buy one if you'd like to hear what your Zune can really do - you will not be disappointed. Unpacking the box was a pretty standard experience: the ZK500 is held in place by Styrofoam wrapped in plastic. Accessories in the box include the power cable, a relatively small AC power brick, three plastic dock adaptors (labelled A, B, and C), a remote control, a 24-inch long 3.5mm minijack male to male cable (for connecting an auxiliary source) and the manual. Looking in the manual I discovered that dock adaptor "A" is for the original Zune 30, "B" is for the Zune 80, and "C" is for the Zune 4/8. I'm not sure why they didn't just put the model number on the plastic dock pieces - it would cut down on confusion in multi-Zune scenarios. Figure 1: The back of the ZK500. Photo Courtesy of Kicker. The ZK500 has a few cool features that make it more than just a simple Zune speaker dock. First, it has a 3.5mm auxiliary audio input - this means you can connect any device to it and have the audio come out the ZK500 speakers. Another MP3 player? Check. A portable DVD player you want more volume for? Check. A laptop or desktop computer that you don't want to have to buy speakers for? Check. That one input port adds a lot of value to the mix. There are also three RCA jack outputs (video, stereo audio) that allow you to connect the ZK500 to a TV set for instance - again, nice flexibility. Design-wise, if Darth Vadar wanted to strap an MP3 dock to the front of his TIE Advanced X1 Starfighter, this is what he'd reach for. OK, he'd use The Force and float it his way, but you get my point. The design is bold, aggressive, and vaguely sinister. I love it! If the design is a bit much for you, you can buy a skin for it from DecalGirl. With the sale price of the ZK500, you'll have some money left over for a skin or two if you want to change the look of it. 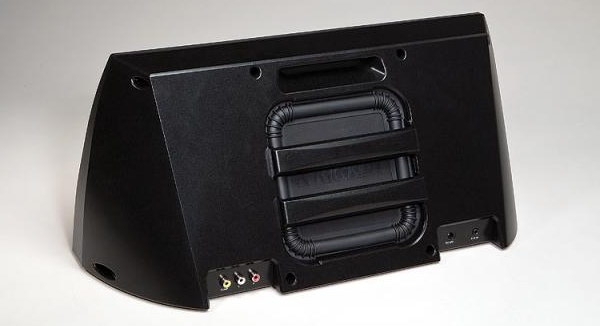 Black goes with pretty much any decor, unlike the platinum/silver motif I've seen on a lot of other speaker docks. That's a video of the iK500, but the speaker hardware is exactly the same, so that's the kind of bass response you'll get from the ZK500.